promotion of cooperation in various sectors including energy. Speaking on the occasion, Shehbaz Sharif said good friendly relations exist between Pakistan and Denmark, and stressed upon the need of further promoting trade, economic, social sector, and exchange of trade and industrial delegations of both the countries. He said Wind Power Energy Company of Denmark was working on power generation project through wind in Punjab, while another Danish company was working in health sector with the Punjab government. The Chief Minister said a conducive atmosphere had been provided for foreign investors in the province, adding the Danish investors could benefit from investment friendly atmosphere in Punjab. Danish Ambassador Ole Thonke said there were cordial relations between Pakistan and Denmark and both the countries were working in the right direction for the promotion of cooperation in different sectors. He said there were vast opportunities for the promotion of trade between both the countries. Cooperation in trade sector between Pakistan and Denmark was of paramount importance, he added. He said a positive message would be conveyed to the business community of both the countries with the promotion of trade cooperation. He said a large number of Danish companies were interested to invest and work on long term projects. Significant measures were being taken for the promotion of trade relations between both the countries, he said and added that economic bonds of both the countries would be further strengthened with the exchange of trade delegations. 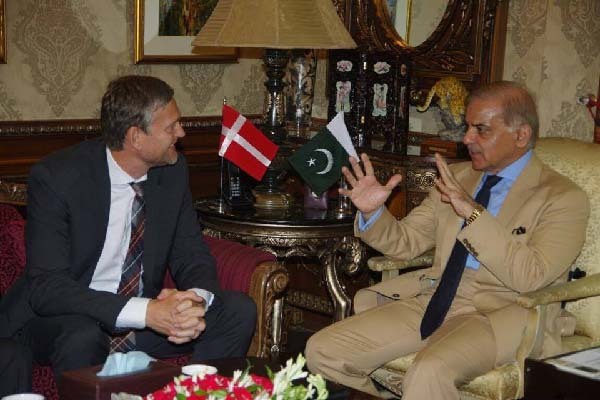 Danish Ambassador thanked the Chief Minister for taking personal interest in the promotion of bilateral relations between Pakistan and Denmark.